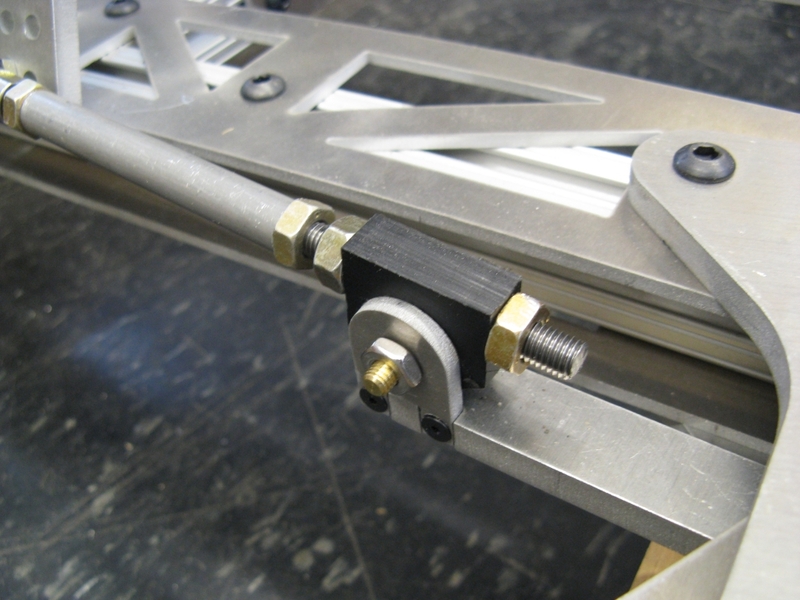 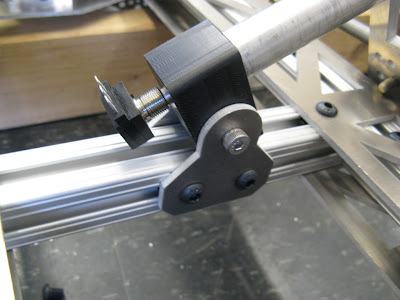 The rear drive modules attach to the rear 80/20 frame using standard t-nuts, though we did have to drill an access hole on the inside of the side rails for the single 1/4-20 screw which holds the rear wheel shafts in place. 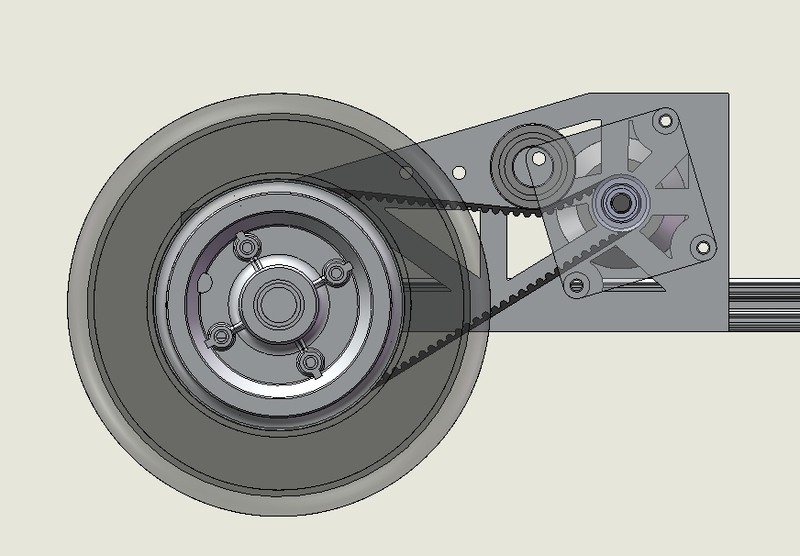 Each drive module has a single Turnigy SK6374-170 motor driving an HTD 5M-15 belt with a gear ratio of 4.5:1. 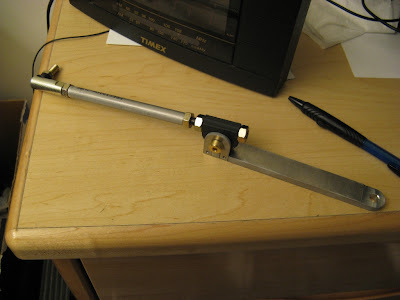 This will give a top speed of....I have no idea. 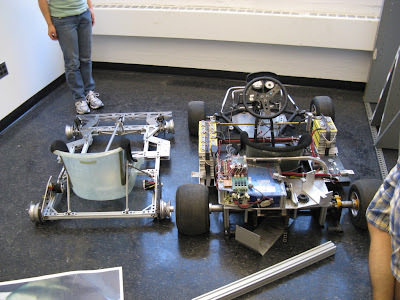 It depends on the motor's performance under sensored control. 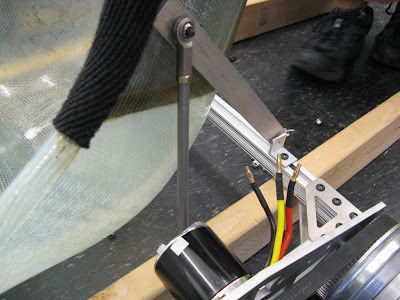 More on that to come. 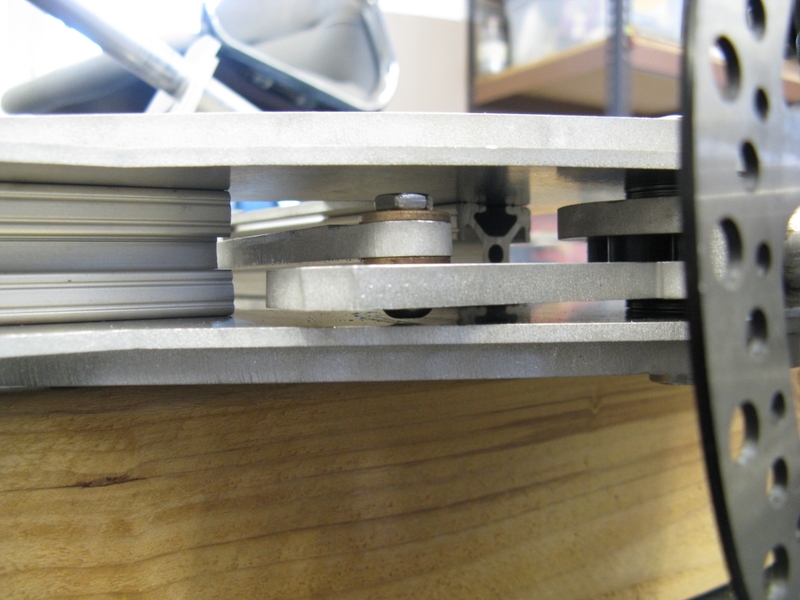 The standoffs and outboard plates for the drive modules have been fabricated, so all that remains are the belt tensioners. We may also modify the motor pulley to have a set screw hub on both sides to leave open the possibility of attaching a second motor to the outboard plate, with the two shafts coupled by the pulley itself. This would not be for the ultralight version, but rather for a high-performance follow-up. 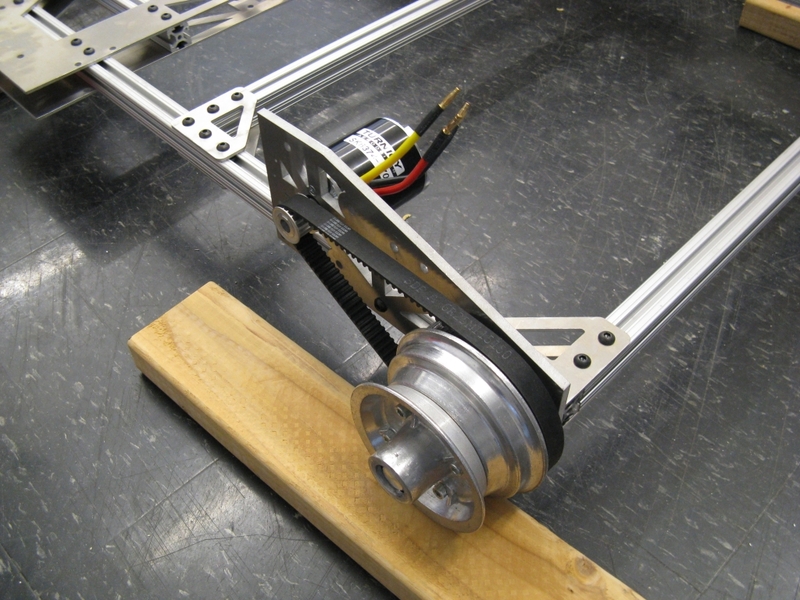 With just one motor per side, the peak force at the ground should still be close to 100lbf. The horizontal pin joint fits, just barely. One brace, constructed in a manner similar to the steering linkage, connects the side of the seat to the side rail of the rear chassis. 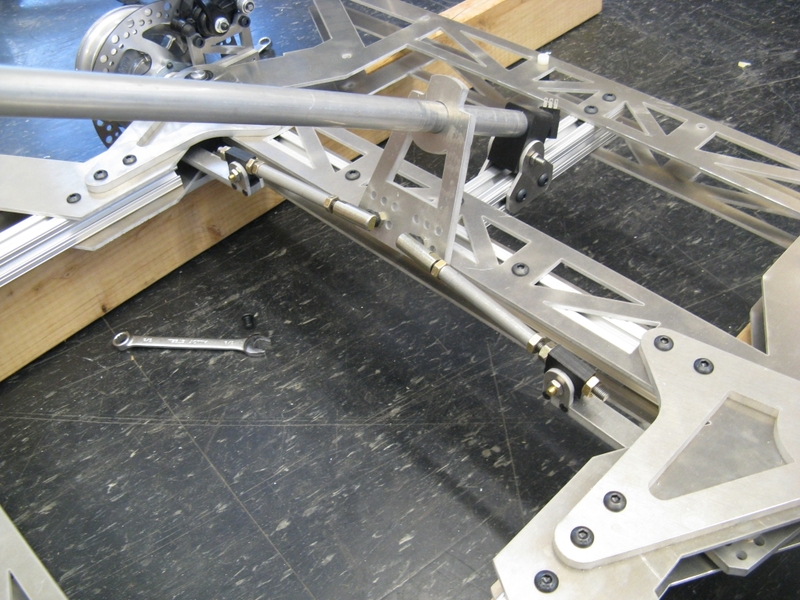 Another brace, a strip of 1/4" aluminum, links the side of the seat to the rear rail. 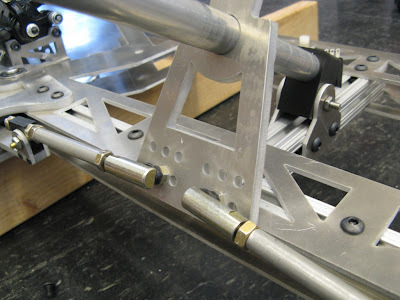 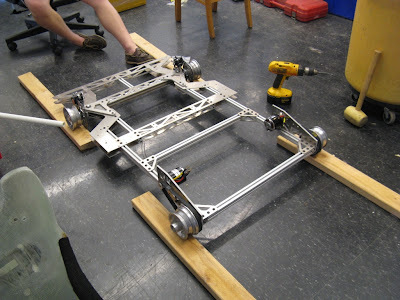 This provides stiffness in all directions and actually makes the frame itself stiffer as well, since it now has structure outside the plane of the main chassis rails. Okay, so it's not a space frame, but for a group that makes everything out of 80/20 and plate stock, I think we did pretty well in 3D. 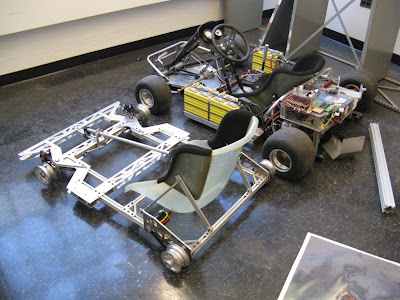 Noticeably absent are the tires and tubes, which should weigh about 3lbs total, the tensioners, the second steering column support, and the wiring. 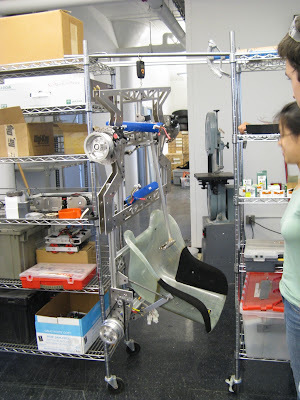 Not noticeably absent but probably the weight killer is minor hardware like controller mounts, switches, etc. 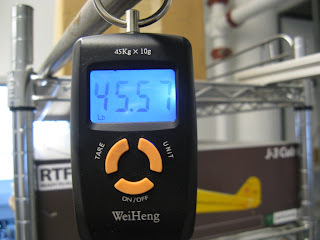 I think we will need to take about 2-3lbs off of our current configuration to meet a 50lb target. Otherwise, 53lbs is the weight of one of Cap Kart's old lead-acid batteries, which was also a potential target. I would not be disappointed either way.